I am a radio guy. I always have been and I probably always will be. Maybe because I have the perfect face for radio- one you don’t have to see. To this day I would rather listen to my favorite teams play with their games described on the radio rather than watch the television broadcast. I am a child of the transistor days when we would all hide our little sets under our pillows at night so we could hear stations from all over the country! Personality radio was the mainstay of the 1960’s when I got to hear the disc jockeys that were larger than life. Having been raised in the northern part of the State of New Jersey, I would be influenced by the amazing men that came across the airwaves from New York City! Such talented voices such as Herb Oscar Anderson, Harry Harrison, Ron Lundy, Dan Ingram, Cousin Brucie, Scott Muni, Bob And Ray, John Gambling, Ted Brown and many more! Radio was so much more than a glorified iPod. I considered these people like family and my day wouldn’t be complete until I woke up with them and got ready for my day in the morning and then do my homework with them after school and then be tucked in by them at night! My favorite stations were always 77WABC, 710WOR, 66WNBC and whatever channel my New York Mets happened to be broadcast upon. In the 1970’s and 80’s, I became quite the fan of classic country music when the Metropolitans were being aired on 1050WHN! I adored the team of Bob Elliot and Ray Goulding when they would perform all their crazy cast of characters every afternoon from 3-7PM on WOR! I don’t know if I would have made it through Junior High without them making me laugh out loud every afternoon as I did my homework to their entertaining skits and spoofs! Another man that was not only a familiar voice in my upbringing but also a huge help in my present day radio career is Cousin Bruce Morrow. He has been on my shows here with me locally offering his still energetic and contagious enthusiasm and now at almost 80 years of age; he has once again offered his talent to get my newest radio venture off the ground. I am once again on the radio as of last Sunday. I am back on the air doing what I love best, which is playing music and connecting with the listeners in celebrating the memories combined with the wonderful music that has been so important to the moments becoming eternally cemented into their hearts and souls! 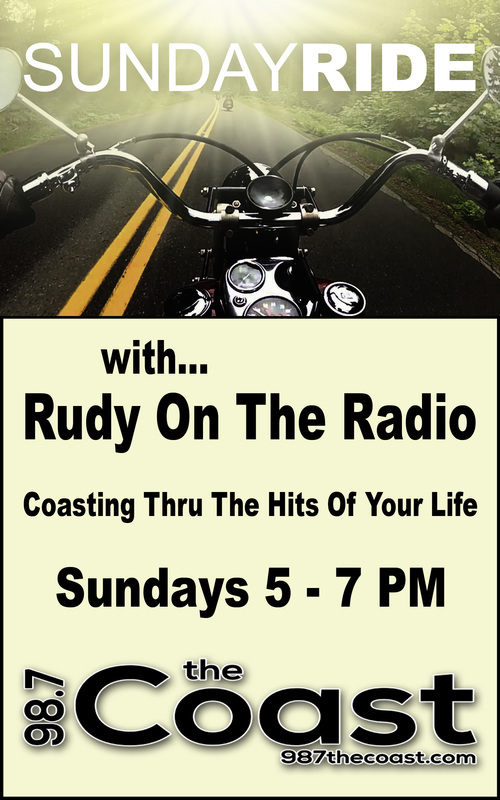 My new show will be called “The Sunday Ride with Rudy On The Radio,” and it will be broadcast live every week from 5-7PM on 98.7 The Coast WCZT. Bob and Jim Maschio and everyone else at Coastal Broadcasting know that when that “On Air” light goes on- every ounce of who I am comes alive! I will be once again interacting with my audience taking their requests and dedications- trying to fill every musical order with all the passion that I can physically muster! Free form radio is when the DJ is given room to not have to be tied to a heavily preordained play list. I will be celebrating the greatest hits of our generation dating back to the 1950’s through today! You may very well hear Nat King Cole and Taylor Swift on the very same program. Growing up, my musical taste was quite eclectic. I loved the balladeers and the Beatles! I played Sinatra and Survivor. I was just as moved by Barry Manilow as I would be by Stevie Wonder or a Waylon Jennings tune for that matter! My Uncle Joey was once a child star in a New York Television Talent Program called Star Time. Also in that cast was Connie Francis. You can say that show biz is in my blood and I was always drawn to my “performing” genes that God wired me with. While what I do as a Preacher is far from an act, when I believe in something- I can’t keep it to myself as I literally bubble over with enthusiasm over what I believe that the whole world needs to know and hear and experience! Maybe this is why I get along so well with so many of the Artists that I have had the privilege to meet and interview in the past. Individuals like Shirley Jones, Janine Turner, Connie Francis, Gary Lewis, Lou Christie, Jimmy Beaumont, Mark Lindsay, Little Anthony, Maureen McGovern, Bobby Goldsboro, Peggy Sue Gerron, Sonny Curtis, Norman Greenbaum, Dodd Darin, The Rip Chords, Barry McGuire, Chuck Girard, Cousin Brucie, Lana Wood, Cathy Silvers and Mary Elizabeth McDonough who we all better know as the gal who played Erin from the Waltons! I am hoping to have many more interviews in the days to come as I love chatting with those people who are so much a part of who we are today! I also continue to do a Christian Based Program called “My Lighthouse with Pastor Rudy.” This sixty minutes of music and sharing I actually record live midweek but it is heard on Praise FM 88.1 at 7AM on Sundays and Lift FM 97.9 at high Noon later in the day! So in reality- Sundays can be a day with lots of Pastor Rudy coming at you from morning to night- not only on the radio but also at The Lighthouse Church with our Services at 9 and 10:45 AM! But much more than me- I want you to know that it is my faith in Jesus that drives everything I do! If you ask me why I do what I do it is simply to fulfill my earthly Dad’s daily admonition to me to “Show them Jesus and Not Fool Around!” So let me close my article with the well-known words that Radio Preacher Dr. Robert A Cook closed every one of his broadcasts with and that was, “Until I meet you again by way of radio, Walk with the King today and be a Blessing!” I pray that I will do just that Dr. Cook!